Inked had the most liked content! 509 my mum says I'm cool. Does the HDI kit come with a flange welded onto the pipe for BOV? I am unsure how much tax would be . it may only work out to be 100-200 which wouldn't be too bad. or maybe talk to a company like North shore Toyota and see if they can get it into NZ at a better price. Motul! H tech 100 plus if you are just street driving / light track or 300v is great for track. 300v is a big price jump All the Llama / Prestige guys run it in their cars so must be somewhat good ha ha. Which track would people be thinking of hitting? unsure if I will travel to far this year as I want to get some house reno done but could be keen on Manfield / Taupo ? we could always plan something later in the year? or does it normally happen around this time. Just remember if you go 9's and want to remain street legal you need a 8 point dont think you can be street legal with a 6 point although I may be incorrect. hmmm very strange then, must be a bad repair of one of the guards as its noticeably wider. Might go find one that's wrecking and grab a guard to match either side. It is not screwed to the guard on passenger side at the moment. need to sort that out. Has definitely had a small crash up front previously as front bumper and passenger guard are different shade of silver. so thinking it may be the wagon guard or non STI guard. and the wagon guards fit the sedan? . I will measure the difference tonight. would say its about 15mm difference. One guard is 1000000000000000% different lol the whole edge is more pumped, i have pulled it off and noticed no repairs / modifications to it. 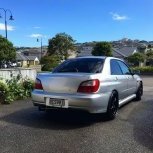 By looking on trademe some of the 2000 shape bugeyes look like they have a more rolled lip. This could also be me comparing the "poverty' vs good ones and maybe it just is a wagon guard? if they fit. the car just had been all aligned etc so I dont see that being the issue. 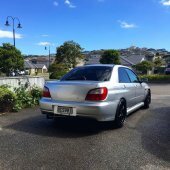 Would the Prodrive have wider guards? Figured out the 2000 shape wrx sti have more of a rolled lip than a arch by looking at them so this is the difference. now to hunt down another. You would need a 6 point at minimum but in your case to keep the car road legal you require a 8 point which goes to the front strut towers. You just go get your MSNZ licence then apply for a authority card no cert required.